. The photo above was made April 14, 1950. All Army Air Forces, Marine Corps, War Assets Administration and Aircraft Salvage personnel have gone. The Civil Aeronautics Administration Flight Service Station is in operation in a former Link Trainer Building. Many buildings have been torn down or moved. Shortly after the war, 17 area schools purchased 101 of the buildings and removed them from the air field. Early April 1942 An Army Air Forces Site Selection Board Flew over Walnut Ridge in search of a new air field site. They returned the following day and were joined by the Army Corps of Engineers from Little Rock. The next several days were spent evaluating the site, conducting preliminary surveys, interviewing local officials, assessing available services, drawing preliminary air field layout, and preparing their recommendation. April 15, 1942 The Site Selection Board recommended Walnut Ridge as a substitute site for the air field planned for Dyersburg, Tennessee. April 20, 1942 The Selection Board's recommendation was approved by Major General George E. Stratemeyer, Commanding General Southeast Air Corps Training Center. May 12, 1942 The War Department directed the Army Corps of Engineers to construct an air field at Walnut Ridge with 3 runways… and plan for more. May 29, 1942 Inter-Departmental Board approved initial Air Field Layout Plans. May, 1942 The Havens and Emerson Construction Company of Cleveland, Ohio selected as the architect-engineer. June 20, 1942 Construction began on the Walnut Ridge Army Air Field. Over the next 18 months, numerous contractors worked on the air field, employing some 1,500 workers. June 23, 1942 The War Department announced contract awards for construction of an air forces training school at Walnut Ridge. July, 1942 Planning and surveying began for a new concrete entrance road from U.S. Highway 67 to the Walnut Ridge Army Air Field. July 4, 1942 Army Corps of Engineers issued Specifications for Construction of WRAAF. July 17, 1942 The Arkansas Highway Department announced bids would be received until July 30 for 7/10 mile access road at the Walnut Ridge air school. After its completion, it would be the widest paved highway in Lawrence County – two feet wider than U.S. Highway 67. July 18, 1942 Contract signed with Ark-Mo Power Company to provide electricity to air field. July 27, 1942 Work began on a new power distribution system. Temporary Headquarters was set up in the Mize Motor Building in Walnut Ridge. Aug 17-25, 1942 100 Troops arrived and were quartered at the CCC Camp north of Pocahontas because there were no facilities available on the main air field. Aug 20, 1942 The 315th Sub-Depot was activated. Aug 22, 1942 Post Engineers set up temporary offices in Building No. 393. Aug 24, 1942 Federal Judge in Little Rock issued a temporary restraining order against Lawrence County Sherriff Archer and Walnut Ridge City Marshal Buchanan from interfering with efforts of three American Federation of Labor representatives to organize workers at the aviation school project near Walnut Ridge. Aug 25, 1942 937th Guard Squadron arrived from Gunter Field, Alabama. Aug 27, 1942 State Federal Housing Administration director says the FHA will finance a war housing project at Walnut Ridge. Aug 28, 1942 Permanent restraining order against City Marshal Buchanan from interfering with efforts of AFL representatives issued. Insufficient evidence to show Sheriff had interfered. Temporary order dissolved. Aug 29, 1942 The 856th Signal Service Company was activated for Telephone, WX, Teletypewriter and Telegraph Service. Early Sept, 1942 The final mission of the air field was still in question. Plans were being made for gliders, including requests for instructional materials, gliders and tow planes. Sept 1, 1942 The First Station Hospital was set up in the former infirmary at the abandoned CCC Camp at five-mile spring, near Pocahontas. State Health Department Officer and Chief Sanitary Engineer inspect sanitation facilities and programs at the air field. Sept 5, 1942 Post Headquarters moved from Mize Motor Building in Walnut Ridge to Building No. 224 on the air field. Aerial Photographs of the City of Walnut Ridge and the air field were taken. Sept 6, 1942 Base Weather Station set up. Sept 7, 1942 Bus Service from Pocahontas to the Air Field started. Fare: One-Way 25 cents, Roundtrip 30 cents. Airplane Mechanic school started at the CCC Camp near Pocahontas. Sept 14, 1942 314th Aviation Squadron activated. Sept 15, 1942 777th Chemical Co., Avn. Service activated. Detachment 851st Ordnance Co. Avn. Service activated. Sept 15, 1942 Walnut Ridge added to War Production Board defense housing critical area list. Sept 17, 1942 It was revealed that back in August, in downtown Walnut Ridge, Union Organizers refunded the $8.50 membership fee to disgruntled farmers after failing to provide them jobs at the new army air field as promised. Sept 24, 1942 Base Hq. and Air Base Squadrons moved from C.C.C. Camp at Pocahontas to the Air Field. Sept 24, 1942 The 687th, 688th, 689th, and 690th Basic Flying Training Squadrons (designated School Squadrons at that time) arrived from Greenville, MS.
Consolidated Mess No. 1 opened in Building No. 321. Sept 28, 1942 Red Cross Field office organized. 3rd Airways Communications arrived from Hensley Field, TX. The Station Hospital was relocated from the former CCC Camp near Pocahontas, to the new Hospital Buildings at the air field. 15 patients were hospitalized during the time it was located at the CCC Camp. Late Sept, 1942 The Southeast Training Command at Maxwell Field finally clarified the air field’s mission by announcing 102 Aviation Cadets and 3 Student Officers from Decatur, Alabama, and 20 Aviation Cadets from Camden, Arkansas, would be sent to Walnut Ridge for Basic Flight Training. Oct 3, 1942 First Planes arrived. First U.S.O. Dance held in Walnut Ridge. Post Engineers move into Post Engineer Building No. 410. Oct 8, 1942 Craighead Electric issues drawing showing lines removed, lines relocated, customers disconnected (16), and customers reconnected (5) at the Walnut Ridge Basic Flying Field site. Oct 10, 1942 Cadet Detachment activated. First Class of Cadets (43-B) arrived. 59 Instructors and 140 Airplanes were ready for the first class. Oct 12, 1942 Flight Training began at 1:00 P.M. The ramp was not entirely completed and planes were parked in the dirt, near runway 4-22. The enormous clouds of dust created by dozens of airplanes cranking up blanketed the entire field with dust. Oct 17, 1942 Cadet Edward S. Musolf involved in an aircraft accident in a BT-13, SN 41-22240. The pilot applied too much brake while taxiing and aircraft tipped on nose. Minor damages; no injuries. Oct 20, 1942 Sales Store opened. First WRAAF radio show was presented over KBTM in Jonesboro. Oct 21, 1942 An overhead aerial photograph of the air field was taken showing the construction progress. Oct 23, 1942 The 687th, 688th, 689th and 690th School Squadrons re-designated as Basic Flying Training Squadrons. The Northwest Arkansas Times reported that the Razorback Band may join the Army as a Unit. Forty-four band members may go to Walnut Ridge AAF. Oct 24, 1942 Cadet Dance was held in Jonesboro. Military Police patrol Jonesboro for first time. Oct 25, 1942 683rd, 684th, 685th and 688th Basic Flying Training Squadrons arrived by train from Cochran Field, Macon, GA and transferred by truck to WRAAF. 686th HQ and Headquarters Squadron departed Cochran Field, Macon, GA by train for WRAAF. Oct 26, 1942 Mass Razorback Band Enlistment reported unlikely. Oct 31, 1942 About 10 members of the Razorback Band have left school for Walnut Ridge to enter the army air corps. Nov, 1942 Pocahontas and Bono Auxiliary Fields pressed into temporary service. Nov 13, 1942 Several Photographs of Main Air Field and Auxiliary Fields were made. Nov 15, 1942 2nd Lt JOHN W. GILLETTE III and CPL DONALD H. BUCKLIN were killed in an accident in BT-13, SN 41-21500, at Conway. The aircraft crashed during low altitude acrobatics. This was the first fatal accident of pilots from WRAAF. A $58,256 contract was awarded to Blahner Construction Co., Chicago, for Civilian War Housing, consisting of 4 dormitories, I recreation building and 1 mess hall. 1 single-story 27-bed unit and 1 two-story 57-bed unit was for men. 1 single-story 22-bed unit and 1 two-story 48-bed unit was for women. Nov 16, 1942 Class 43-C began training at WRAAF with the 683rd Basic Flying Training Squadron. 15 Students from 43-B were held over for Class 43-C.
Nov 17, 1942 Army Emergency Relief Organization established. 851st Ordnance Company re-designated the 2062nd Ord. Co, Avn. Service. Provost Marshal Sweeney returned an army deserter, who was arrested near Manila, Arkansas yesterday, to Fort Knox, Kentucky today. Post Office opened in one-half of Building No. 603. Nov 19, 1942 Pocahontas STAR HERALD dedicated a special section to the Base. 946th QM Platoon “T” AB arrived from Greenville, MS.
Nov 20, 1942 Enlisted men who were recruited by this Station complete basic training here. Nov 21, 1942 The Recreation Center at Pocahontas opened. Pocahontas went “all out” for the servicemen from the air field, providing an elaborate, wholesome Recreation Center on the top floor of the old courthouse. 315th Sub-Depot met at the Lodge at Craighead Forest for final “fling” before gas rationing began. Nov 23, 1942 Base Chapel opens. Civilian Aircraft Mechanic Boyce J. Durrett, Jr., involved in Minor aircraft accident in a BT-13, SN 41- 023069. Leaked gas ignited. Minor damages. Burns to hands wrists, right leg and left cheek. Nov 24, 1942 Pocahontas Soldiers’ Center opens. Nov 26, 1942 Open Post on Thanksgiving Day. Nov. 27, 1942 First Live Talent Show presented at Post Theater at 7:00 P.M. by USO Camp Theater Guide. Nov 28, 1942 Class 43-D arrived. One mile east of WRAAF while on a local night flight. Cause undetermined. Probably engine failure, based on angle of impact. Maxine Greggs of the 315th Sub-Depot and S/Sgt Bob Flowers with the 688th School Squadron were married 8:00 P.M. at the First Methodist Church in Walnut Ridge. Rev. R.E.L. Bearden officiated. Dec 3, 1942 Camel Caravan Unit entertains officers, Cadets, and enlisted personnel in the Post Recreation Hall. Dec 5, 1942 Work on Power Distribution Service Completed. Col. Leroy Hudson and Col. Arnold, from Air Service Command in Ft. Worth visited the facility and were pleased with the operation. Dec 12, 1942 First Class of Cadets Graduated (43-B). Senator-elect John McClellan spoke. First operation performed in the Base Hospital. Dec 19, 1942 Edmund H. Tooley, 2nd Lt., (Instructor) and David E. Lake, 2nd Lt. involved in aircraft accident in BT- 13, SN 41-22210, (BL703). Plane iced-up in freezing rain. Pilot made emergency landing in a field. Major damage. No injuries. Walter H. Howe, 2nd Lt., (Instructor) and Carl J. Kohl (Kehl?) (Pvt.) involved in major aircraft accident in BT-13, SN 41-22973. Night forced landing after becoming lost in marginal weather… serious injuries to both occupants. Dec 22, 1942 Photographic Building No. 604 completed. It was one of few buildings at the time which had steam heat and air conditioning. Dec 23, 1942 Post Theatre opened. The theatre had a seating capacity of 600; and, like most buildings, access was by wood sidewalks which sometimes floated away during heavy rainstorms. Dec 23, 1942 The Service Club in Jonesboro opened. Dec 24, 1942 Brown and white terrier mascot weakens from hunger strike while her master, Cpl Raymond M Hederman, is on leave. Dec 28, 1942 Class 43-D arrived. Dec 31, 1942 First Dance held in the Officers’ Club. 1942 – 1944 Air field streets were initially named First St., Second St., Third St… up through Ninth Street; then Avenue A, B, C, and D. By the time the air field was deactivated almost all streets had been renamed for pilots who were killed in training. Jan, 1943 Department of Training moved to Link Trainer Building #95. It had temporarily operated in the Cadet Operations Building just south of Base Operations. Jan 1, 1943 Enlisted men promoted. take-off in BT-13, SN 41-22751 (W409). Major damage, No injuries. Brown and white terrier mascot ends 11 day hunger strike when her master, Cpl Raymond M Hederman, returns from leave. WRAAF. Instructor House and Cadet Norman A. Ulrich had aborted takeoff, and while slowing to turn off the runway, when their aircraft was run over by a BT-13, SN 41-23095, piloted by Cadet Joseph P. Walter and Cadet Hewet S. Hunsdon. Major aircraft damage. Cadet Ulrich received serious injuries, and was in a coma for several days. Cadet Joseph P. Walter and Cadet Hewet S. Hunsdon were involved in an accident in a BT-13, SN 41- 23095, at the WRAAF. Immediately after liftoff, they ran over a BT-13, SN 41-21730, piloted by 2nd Lt. Harry B. House, Instructor, and Cadet Norman A. Ulrich. Major Aircraft damages. No injuries to Cadets Walter and Hunsdon. Jan 21, 1943 William O. Rupert, Cadet Pilot, and John F. Ludwig, Cadet Passenger, involved in aircraft accident with major damage in BT-13, SN 41-1631 (700). No injuries. Jan 25, 1943 Class 43-C Graduated. Jan 26, 1943 Recreation Hall completed and opened. Jan 29, 1943 2nd LT. FRANK W. ROBERTS and 2nd LT. ARTHUR KRASNE killed in an accident in BT-13 SN 41- 23037, near Camilla, GA while on a night cross country flight. While cruising at 3,000, the flight encountered low clouds and dived to get below the layer. The aircraft crashed into a sugar cane field. Another aircraft reported the ceiling around 700 feet. Jan 30, 1943 Class 43-E arrived. Feb 1, 1943 389th AAF Band activated. Feb 4, 1943 The Public Relations Office began publishing “Base Field News”, an 8-page mimeographed publication. This later developed into a multigraph-printed paper called “Bars ‘N Stripes”, with 24 pages. Feb 6, 1943 Cadet WILLIAM M. COZINE, JR. and Cadet JOHN L. MALM killed in an accident in BT-13, SN 41- 22940. Structural failure resulted in loss of outer wing sections. Cadet Malm, in rear cockpit, jumped out at approximately 100 feet. Cadet Cozine remained in the aircraft. Aircraft totaled. Feb 10, 1943 Chuck Foster’s Band plays at W.R. on NBC Coca Cola “Spotlight Band” 142 Station nationwide hookup. Featured soloist was Dottie Dodson. The program originates from a different army, navy or marine facility each night. The following night the band played at the famous Peabody Hotel in Memphis. The Sub-Depot lean-to on opposite end from engineering lean-to is nearing completion. It will be that same style as the other except constructed of wood, rather than steel. It will house fabric and engine installation branches of engineering and new aero repair office on ground floor. Sub-Depot Headquarters will be on second floor. Feb 12, 1943 Ray Herbeck and his orchestra played. Feb 13, 1943 Over My Dead Body played at Base Theater. Feb. 14-15 The Commandos Strike at Dawn played at Base Theater. accident in BT-13, SN 41-23028, near Paragould. During a simulated forced landing, the pilot attempted a turn at low altitude. The aircraft stalled, made a 1 turn spin, and crashed. The aircraft was totaled. General Ralph Royce, Commanding General of AAFSETC, visits WRAAF. Stag Dinner in the Officers’ Club. WRAAF Officers Attending: Colonel John F. Guillett, Commanding Officer, Lt. Col. Lincoln W. Redd, Executive Officer, Capt. Albert C Milburn, Adjutant, Lt. Col. Littleton J. Pardue, Capt. Terance R. Harp, Capt. James H. Woodside, Capt. Harry F. Cruver, 2nd. Lt. Dennison W. VanVleck, 2nd. Lt. Halvor S. Dalton. Guest of Honor: Major General Ralph Royce, Commanding General, AAFSETC, Maxwell Field, Ala.; Distinguished Guests: Brigadier General WW Welsh, Chief of Staff, AAFSETC, Maxwell Field; Colonel John G Williams, Acting Deputy Chief of Staff, AAFSETC; Colonel J F McBlain, Assistant Chief of Staff, A-3, AAFSETC; Colonel Daniel A Cooper, Commanding Officer, AAFBFS, Newport, Ark. ; Colonel Edgar R Todd, Commanding Officer, AAFAFS, Stuttgart, Ark. ; Colonel Roy T Wright, Commanding Officer, AAFBFS, Malden, Mo. ; Colonel Kurt M Landon, Commanding Officer, AAFAFS, Blytheville, Ark. Feb 16, 1943 Welfare Association activated. Dr Gilispie’s Assistant played at Base Theater. Feb. 25, 1943 A fire occurred at about 2000 in Building 43, located near the control tower. Feb 28, 1943 Class 43-D graduates. Mar 1, 1943 Class 43-F arrives. Mar 7, 1943 Post Headquarters moved from Building No. 224 to Building No. 623. (Building 224 proved to be too small and had inadequate heat and ventilation.) Bldg. 623 had been planned as a Ground School building, but was used by the Area Engineer until Headquarters moved in. Mar 8, 1943 Construction started on 260 modern, clay-tile apartment units. Mar 14, 1943 In recognition of their outstanding work, 5 men were extended the privilege of making free phone calls. Headquarters Squadron, 11th Basic Flying Training Group. Mar 16, 1943 Cadet ROBERT S. HAWES killed in a mid-air collision in BT-13, SN 41-1107. His aircraft flew into the landing gear of a BT-13, SN 41-22333, piloted by 2nd LT Louis R. Semrau and Cadet Wyman E. Osness. Lt. Hawes aircraft entered a dive and crashed, totaling the aircraft. The other aircraft received major damage. The pilots were not injured. 2nd Lt. Louis R. Semaru and Cadet Wyman E. Osness involved in aircraft accident in BT-13, SN 41- 22333, when a BT-13, SN 41-1107, piloted by Cadet Robert S. Hawes, flew into the landing gear of their aircraft. Lt. Hawes was killed. Lt. Semaru and Cadet Osness landed safely with no injuries. Their aircraft received major damage. Mar 21, 1943 Pocahontas Soldiers Center held open house from 3 – 7 P.M.
Mar 22, 1943 Street lights installed. Mar 23, 1943 It was reported that the former Headquarters Building was being remodeled for use as a Library and General Service Club. April 1, 1943 Class 43-E graduated. April 3, 1943 Class 43-G arrived. U.S.O. Camp Shows, Inc. presented THE CRAZY SHOW, emceed by Ben McAtee, and featuring a fine cast of entertainers. April 9, 1943 The Civilian War Housing was completed. Rents were: Private room, $15/mo., or $10 per month with 2 per room. Rent was $5/month if 3 people shared a room. Charles C. Porter, 1st Lt., Instructor, and James E. Bird, Cadet, involved in aircraft accident in BT-13, SN 41-23066 (W511), with Major damage and no injuries. After landing they struck a BT-13 SN 41- 11374, piloted by Malcomb B. Edens, 1st Lt, Instructor, and Thomas A, Pirtle, Cadet, which swerved into their path. Malcomb B. Edens, 1st Lt, Instructor, and Thomas A, Pirtle, Cadet, involved in aircraft accident in BT- 13, SN 41-11374, with major damage and no injuries. Their aircraft was struck after they swerved into the path of a BT-13, SN 41-23066, which had just landed, piloted by Charles C. Porter, 1st Lt., Instructor, and James E. Bird, Cadet. April 15, 1943 Mrs. Minnie Swindle, mother of Lt. Robert J. Swindle of Walnut Ridge, was presented the Air Medal by Colonel John F. Guillett at a formal review at the WRAAF. The medal was earned by her son for operations over Europe. He was a bombardier on a B-17 which was shot down January 23, 1942. Responsibility for Coal storage and delivery transferred from Quartermaster Corps to Corps of Engineers. Noble J. Klink, Cadet (Pilot) and Edward J. Moroney, Cadet, involved in aircraft accident in BT-13, SN 41-22887, with minor damage and no injuries. On a cross country flight, pilot ran into a wire line about 200 yards from the field at Whiteville, TN., breaking off the Pitot tube. April 25, 1943 Special Easter Service held on the ramp. April 26, 1943 Work began on Sewage Treatment Plant. Prior to this a 40x60 foot septic lagoon was used. At the time the air field was activated, pit latrines were used. May 1, 1943 Class 43-H arrived. Phyllis Stradtner of the 315th Sub Depot and David Knight were married at 4:00 p.m. at his home in Parkville, Mo. Dr. E.H. Hawley officiated. May 5, 1943 John E. Whitten, Cadet, involved in aircraft accident in BT-13, SN 41-23040 (W714.) Student ran out of fuel as he prepared to enter traffic pattern on a local night flight and stalled about 40 feet in the air as he attempted to land in an open field. Major damage. Minor injuries. May 8, 1943 Miss Pansy Varvil married Paul Vines of Deleplane were married at Paragould in the home of Judge Weldon, who officiated. May 10, 1943 First occupant moved into Civilian War Housing. May 11, 1943 Arlene Corzine and Jack Clark McGlothin were married in Methodist Parsonage in Walnut Ridge with Rev. R.E.L. Bearden officiating. May 12, 1943 Mr. Henry C. Wright, 315th Sub-Depot employee, was killed. Due to floodwaters, he was unable to ride with his usual party, and while walking home, was struck by a car and killed. Cause of death: Devotion to Duty. A local youth, H.B. Holder, Jr. turned himself in to the Lawrence County Sheriff the following morning, stating he did not see Mr. Wright. May 17, 1943 William H. Hall, Cadet, bailed out of BT-13, SN 41-22913, when he was unable to recover from a spin. Aircraft was totally demolished. Cadet Hall was uninjured. held at the Salad Bowl. Burgess with the 315th Sub-Depot announces her engagement to Yahotti. Lt. F.R. Slocum arrived from Big Springs, TX to replace Lt. K.G. Lindersmith as Sub-Depot Supply officer. Lt. Lindersmith is transferring to Rome, NY. May 22, 1943 Class 43-G graduated. “Redhead from Manhattan” and “Good Morning Judge” played as Post Theater. May 25, 1943 “I Escaped from the Gestapo”, “Heavenly Music”, and “Duty and the Beast” played at Post Theater. May 26-27, 1943 “The More the Merrier”, Universal Newsreel #190”, The War Issue #1” played at the Post Theater. May 28, 1943 The Base Finance Office was designated as a Regional Central Office over Malden, Stuttgart, Newport, and Blytheville Army Air Fields, and Primary Schools at McBride and Cape Girardeau, Mo. and Helena, AR. “They Came to Blow Up America”, “U.S. Army Band” and “The Boy and the Wolf” played at the Post Theater. May 29, 1943 2nd LT. SEYMOUR E. AUBORN and Cadet CHARLES F. CONN JR. were killed in an accident in a BT-13, SN, 41-22179, near Poplar Bluff, Missouri. Engaging another BT-13 in simulated combat, starting at 3,500 feet, the planes flew lower, and Lt. Seymour and Cadet Conn were unable to recover from a low altitude maneuver, striking the ground. The plane was totaled. ‘It Comes Up Love” and “The Man Trap” played at the Post Theater. May 30, 1943 Class 43-I arrived. June 1, 1943 Post Laundry opened. The laundry was designed as a 10,000 man facility, and served Walnut Ridge AAF and nearby fields. June 2, 1943 Pfc. Earl P. Murphy, died from shock and wounds suffered about 10:00 a.m. last Wednesday when he accidentally dropped his gun which discharged, inflicting fatal wounds. Pfc. Murphy was one of the first guard squadron members to arrive at the air field last August. June 5, 1943 Gladys Ahlsteadt of the 315th Sub-Depot, married Lt. Phil Scallon at Post Chapel with Lt. Kinsella officiating. June 7, 1943 WACs arrived. Employee Joseph H. Williams tops the list for War Bond buyers in the 315th Sub-Depot with a deduction of $25.00 semi-monthly. June 12, 1943 “Swing Your Partner” and “Gildersleeve’s Bad Day” played at the Post Theater. June 13-14, 1943 “Mission to Moscow”, and “Universal Newsreel#195” played at Post Theater. June 20, 1943 John A Dooling, 2nd Lt., Instructor, and Oscar W Wylie, 2nd Lt, Instructor, involved in aircraft accident in AT-10BH, SN 41-26651 (W805), while on proficiency ride. Instructor placed the landing gear switch in the up position while the aircraft was rolling down the runway, causing the landing gear to retract. Minor damage, with no injuries. June 21, 1943 Willard A. Mason, 2nd Lt, Instructor, and Ralph D. Grossgrove, Cadet, involved in aircraft accident in BT-13, SN 41-22241 (W420.) The aircraft stalled on an instrument takeoff. Major damage. No injuries. June 24, 1943 Sub-Depot softball stars, which comprise most of the Federal Compress Team, defeated the Ark-Mo Power team in the Walnut Ridge League. June 25th, 1943 Cadet Stanley D. Wolf involved in an aircraft accident in a BT-13, SN 41-10884. On landing approach, stalled 10’ above the ground. Major damages. No injuries. June 26th, 1943 Cadet Noel A. Cunefare involved in an aircraft accident in a BT-13, SN 41-22243 (W200.) On landing approach, stalled 10’ above the ground. Major damages. Minor injuries. June 28, 1943 Biggers Auxiliary Field completed. July 1, 1943 The 684th Basic Flying Training Squadron assigned duty of maintaining PLM (Production Line Maintenance) Hangar. July 2, 1943 Class 43-J arrived. The 315th Sub-Depot Baseball team, the Pocahontas Redskins, played the Walnut Ridge Army Flyers under the lights in Jonesboro. “Orchestra Wives” played at the Post Theater. July 3, 1943 “All By Myself” and “Stranger From Pecos” played at the Post Theater. Norma Jean Johnson, with the 315th Sub-Depot, was married to Pvt. Ercel Craig at 8:00 P.M. in the parsonage of the First Baptist Church in Pocahontas. Rev. H.E. Williams officiated. July 4, 1943 Seventeen-year-old young men were guests of the Aviation Cadets. July 4-5, 1943 “Aerial Gunner” and “The War Issue”, Universal News Reel” played at Post Theater. July 6, 1943 “Gitterbugs”, “Rover Rangers”, “Memories of Australia”, and “Ration for the Duration” played at the Post Theater. July 7-8, 1943 “Mister Big”, “Universal Newsreel”, and “March of Time” played at the Post Theater. July 9, 1943 “My Sister Eileen”, “Accent on Courage”, and Greetings Bait” played at the Post Theater. July 10, 1943 “Wings Over the Pacific” and “Songs of Texas” played at the Post Theater. July 14, 1943 2nd Lt. Donald K. Hartley and Cadet WALTER J. TOMASZEWSKI involved in an accident in BT-13, SN 41-22333. Cadet Tomaszewski was practicing spin recovery. The aircraft failed to recover and the instructor ordered the student to jump out. The student refused. At the lowest possible altitude, the instructor jumped. Lt Hartley received minor injuries. Cadet Tomaszewski was killed. July 15, 1943 The 315 Sub-Depot softball team lost to the Walnut Ridge Fire Station. July 17, 1943 “Two Senoritas From Chicago”, and “Leather Burners” played in the Post Theater. July 18, 1943 Sub-Depot “Redskins” baseball team played at Pocahontas. July 18-19, 1943 “Stage Door Canteen” and “Universal Newsreel” played in the Post Theater. July 20, 1943 “Crime Doctor”, “Champions, Training Champions”, “Popular Science,” and “Hop and Go” played in the Post Theater. July 21-22, 1943 “Bataan” and “Universal Newsreel” played in the Post Theater. July 23, 1943 “Seven Days Leave”, “Dog House”, and “Jack Wabbit and the Beanstalk” played in the Post Theater. July 23, 1943 Cadet ARTHUR F. GRESLIN and Cadet ARTHUR H. STEIN were killed in accident in a BT-13, SN 41-23003, while on a cross country flight near Harviell, Missouri. The plane was seen circling a group of trees, when the right wing struck a tree. The aircraft crashed and burned. The engine was running at the time of the crash. July 24, 1943 “Two Tickcets to London”, and “Yanks Ahoy” played in the Post Theater. July 26, 1943 Cadet Laurence W. Winn involved in an aircraft accident in a BT-13, SN 41-21316 (W602?). Unable to recover from intentional spin, he bailed out. The airplane crashed and burned. Minor injuries. July 29, 1943 Service Club opened in the center section of Building No. 224. July 30, 1943 Cadet Herbert O. Knothe involved in an aircraft accident in a BT-13, SN 41-21466. Ground looped, excessive braking, nosed over. Major damage. No injuries. July 31, 1943 Maida Myers, of Hoxie, with the 315th Sub-Depot was married to Air Corps Lt. William R. Elliot in the Post Chapel. Father Kinsella officiated. August 4, 1943 Cadet DEAN PRESTON was killed in an accident in BT-13, SN 41-22476, about 15 miles west of WRAAF. The aircraft was observed spinning with the parachute entangled in the tail. Just before striking the ground the parachute came free of the tail, but was too damaged to break the fall. The plane was totaled. 2nd LT. LEON G. SPITZER and Cadet ALFRED M. TUA were killed in an accident in a BT-13, SN 41-22918, approximately 3 miles north of WRAAF. After practicing a simulated forced landing, the plane climbed to about 700 feet, where it stalled, entered a spin, crashed and burned. The plane was totaled. The first of 260 apartments units was assigned. The original plans called for coal to be used for heating and cooking; however a change order was issued to provide for kerosene heating and cooking stoves and kerosene hot water heaters. Wood frame coal bins had been constructed at each unit prior to the change order. August 8, 1943 1st Lt. William A. Kelley and Pvt. Henry J. Cusson involved in an aircraft accident in a BT-13, SN 41-11078. Engine failed at 8,000 feet. Student bailed out. Instructor landed in a cotton field. Major damages. No injuries. August 8, 1943 The 315th Sub-Depot Baseball team, the Pocahontas Redskins, defeated the Black Rock team 12 to 1 in Black Rock. August 14, 1943 “Melody Parade”, “Streamlined and Stamina”, “Merchant Convoy”, and “Canine Commandos” played at Post Theater. August 15, 1943 Swimming Pool completed. soldier was guest of the Army Command at the Air Field. Aug. 15-16, 1943 “Du-Berry Was a Lady”, “The War”, and Universal Newsreel played at the Post Theater. Aug. 17, 1943 “Pilot #5”, “Jungle Land”, “Rationed Rhythm”, and “The Aristo Cat” played at the Post Theater. Aug. 18-19, 1943 “The Constant Nymph” and “Universal Newsreel” played at the Post Theater. Aug. 20, 1943 “Pittsburg”, “The Armless Dentist”, and “He Can’t Make it Stick” played at the Post Theater. Aug. 21, 1943 “Here Comes Kelley”, and “Petticoat Larceny” played at the Post Theater. Aug. 22-23, 1943 “Dixie”, “This is America”, and “Universal Newsreel” played at the Post Theater. Aug. 23, 1943 Mr. Roy C. Lusk, foreman at the 315 Sub-Depot, and wife, became the proud parents of a new baby girl, Charlotte Myra Lusk. Aug 25, 1943 Class 43-J graduated. Aug 26, 1943 WACs held first party in their Day Room. Cadet Earl H. Bengtson involved in an aircraft accident in a BT-13, SN 41-23155. Student became lost on cross-country flight. After flying 3:50, the student made approach to a field, attempted go-around, crashed into trees. Aircraft totaled. No injuries. Aug 27, 1943 Cadet William H. Otis involved in an aircraft accident in a BT-13, SN 41-22968 (W202.) After take-off at Brinkley, the engine started smoking and cutting out. The airplane nosed-over after student made an emergency landing in a rice field. Major damages. No injuries. 2nd LT. GEORGE F. WOESSNER and Cadet LOUIS R. VASSALLO were killed in an accident in BT-13, SN 41-22276, about 6 miles south of WRAAF. While practicing instrument flying under the hood at about 1,500 feet, the plane entered a steep turn followed by a high speed stall and spin. Recovery was made from the spin too low to pull out of the dive. The plane crashed and burned. “The Forest Rangers”, “Forgotten Treasure”, and “Dizzy Newsreal” played at the Post Theater. Aug 30, 1943 Cadet Edward I. Glenn involved in an aircraft accident in a BT-13, SN 42-43248 (W228.) On a night training flight at Biggers Auxiliary Field the aircraft came in too low and struck a tree 2,000 feet out from the runway. The plane was totally destroyed. Cadet Glenn was seriously injured. The Post Engineer issued a certification stating that the Cannon stoves in Building T-43, which had experience a fire on Feb. 25, were not properly installed. Aug 31, 1943 Class 44-A arrived. Sept 1, 1943 Walcott Auxiliary Filed completed. Sept 1, 1943 Commissary opened in Building No. 397. There was no refrigeration, and meat was stored in refrigerator cars on the rail siding. Sept 3, 1943 Cadet C. M. Stafslien involved in an aircraft accident in a BT-13, SN 41-22216. Cadet Stafslien failed to clear the runway after landing at WRAAF and was run over by BT-13, SN 41-23073, piloted by 2nd Lt. Arthur H. Rich, Instructor, and Cadet Wallace W. Kuhlman. Aircraft totaled. No injuries. Sept 3, 1943 2nd Lt. Arthur H. Rich, Instructor, and Cadet Wallace W. Kuhlman involved in an aircraft accident in a BT-13, SN 41-23073. Their aircraft landed behind a BT-13, SN 41-22216 at WRAAF, piloted by Cadet C. M. Stafslien, and ran over his aircraft. Major damages. No injuries. Cadet Ernest A. Whitall involved in an aircraft accident in a BT-13, SN 41-22244. On a night training mission at Biggers Auxiliary Field, while on takeoff roll, Cadet Whitall’s aircraft struck a BT-13, SN 41-23006, piloted by Cadet Miles L. Sikes, which was on the runway. Major damages. No injuries. Cadet Miles L. Sikes involved in an aircraft accident in a BT-13, SN 41-23006. On a night training mission at Biggers Auxiliary Field, Cadet Miles’ aircraft was struck by a BT-13, SN 41-22244, piloted by Cadet Ernest A. Whitall as he prepared to take-off. Major damages. No injuries. Sept 4, 1943 Cadet Harold R. Wickman involved in an aircraft accident in a BT-13, SN 41-22969 (W203.) On a night training mission at Biggers Auxiliary Field, Cadet Wickman experienced engine failure at about 200 feet, just after takeoff. Major damage. Minor injuries. Sept 7, 1943 Cadet Robert S. Halling and Donald F. Burton involved in an aircraft accident in a BT-13, SN 41-10852 (W20.) Upon landing at Walnut Ridge following night transition training at Biggers Auxiliary Field, Cadet Halling’s plane ran into a BT-13, SN 41-22949, piloted by Cadet John F. Clark. Major damages. No injuries. Cadet John F. Clark involved in an aircraft accident in a BT-13, SN 41-22949 (W110.) Upon landing at Walnut Ridge following night transition training at Biggers Auxiliary Field, Cadet Clark’s plane was run into by a BT-13, SN 41-10852, piloted by Cadet Robert Halling. Aircraft was totaled. Engine O.K. No injuries. Sept 10, 1943 Cadet Robert B. Kalnitz involved in an aircraft accident in a BT-13, SN 41-22306 (720.) Mid air collision with a BT-13, SN 41-21549, piloted by Cadet Bertram D. Lobdell, during a three ship formation flight. Major damages. No injuries. Cadet Bertram D. Lobdell involved in an aircraft accident in a BT-13, SN 41-21549 (703.) Mid air collision with Cadet Kalnitz during a three ship formation flight. Cadet Lobdell bailed out. The airplane was totaled. No injuries. Sept 14, 1943 2nd Lt. Frederick R. Ernst, Instructor and S/Sgt. Benjamin J. Terbetski involved in an aircraft accident in a BT-13, SN 41-23025 (W307.) Forced landing following engine failure at 500 feet. Major damages. No injuries. Sept 15, 1943 260 Housing units opened on the air field. They were divided into three sections, one north of Avenue D, designated for Officers, one east of Eighth Street, for enlisted men, and one west of Eighth Street, for civilians. Sept 18, 1943 Third Field Day was held. Good Conduct Medals awarded. Rose Lansford, an employee of the 315 Sub-Depot Supply Warehouse daughter of Mr. & Mrs. J.H. Lansford of Jonesboro, was married to Melvin Roark of Jonesboro in the First Baptist Church in Paragould. Sept 23, 1943 2nd Lt. Robert C, Benson, Instructor and Cadet Anson F. Barton involved in an aircraft accident in a BT-13, SN 42-43071 (W29.) The Instructor landed outside the air field markers, and ran in a ditch while taxiing to the runway. Major damages. No injuries. Sept 23, 1943 Cadet ROBERT E FITZGERALD and Cadet EMMANUELE ANGELLO were killed in an accident in a BT-13, SN 41-22471, eight miles east of Luxora, Arkansas. While on a formation cross country flight the formation encountered very heavy clouds and low ceilings. Cadet Fitzgerald evidently lost control of the plane he was flying, entered a spin, and crashed. The airplane was totaled. Cadet HENRY J LAVAN was killed in an accident in a BT-13, SN 41-21615 on a routine training flight. The aircraft crashed into a wooded area 5 miles east of Pocahontas, and burned. Cause was not determined, though a low altitude stall is suspected. The aircraft was totaled. 2nd Lt. Norbert E. Henkel involved in an aircraft accident in a BT-13, SN 41-22182 (W23.) Lt. Henkel landed on the grass at Walnut Ridge. While taxiing to the ramp he hit a large hole. Major damages. No injuries. Sept 27, 1943 2nd Lt. Harry C. Kuschel, Instructor, and Cadet William Dulligan involved in an aircraft accident in a BT-15, SN 42-41507 (W123.) Engine failed in flight resulting in forced landing in a poor field. Major damages. Instructor received minor injuries. Cadet Robert B. Hanover involved in an aircraft accident in a BT-13, SN 41-11196 (W326.) Cadet Hanover started the engine at Bono Auxiliary Field. An engine fire ensued, startling the Cadet, who abandoned the plane. The airplane ran wildly around the field until the gear was torn off and the prop hit the ground. Major damages. No injuries. Sept 28, 1943 Class 43-K graduated. 1st LT. FRANCIS D. STEGNA and Cadet Donald H. Burnett involved in an accident in BT-15, SN 42-41503 west of the WRAAF. While practicing a 3 turn spin from 5,000 feet. The student was unable to recover, then the Instructor attempted to recover. The student was instructed to jump, which he did, receiving only minor injuries. The aircraft crashed and the instructor, LT. FRANCIS D. STEGNA was killed. 2nd LT. ROY D. HAMMOND and Cadet WILLIAM J. DONOVAN were killed in a BT-13, SN 41-22498, crash. It is believed they were practicing a simulated forced landing, and the aircraft stalled at about 50 feet over the trees, plunging into the trees. type yellow clay-tile blocks as the 260-unit apartments. Sept 30, 1943 During the eleven month period from November 1, 1942, thru September 30, 1943, the training hours flown at WRAAF were 160,648. The average for all Basic Flying Schools in the Southeast Training Command was 129,474 hours. Oct 3, 1943 Class 44-B arrived. Claude Varner is the new Sub-Depot General Foreman, replacing William E. Withers, who became an aircraft inspector. Oct 6, 1943 1st Lt. Maurice S. Allen and Cpl. William R. McCoy involved in an aircraft accident in a BT-13, SN 41-1503. Forced landing near Ripley, TN, following engine failure. No damages. No injuries. Oct 7, 1943 Cadet George M Williams involved in an aircraft accident in a BT-15, SN 42-41420. Student landed in a pasture after becoming lost on a cross country flight. Major damages. No injuries. Oct 11, 1943 Cadet Walter Gehrke involved in an aircraft accident in a BT-13, SN 41-11196 (W326.) Student bailed out after unsuccessful attempt to recover from a spin. Aircraft crashed, totaled. No injuries. Oct 12, 1943 1st Lt. William A. Mann involved in an aircraft accident in a BT-13, SN 41-21224. Collided with a BT-13, SN 41-23097, piloted by 1st Lt William D. Shaw, during formation takeoff from Beech Grove Auxiliary Field. Major damages. No injuries. 1st Lt. William D. Shaw and Cadet Harold T. Vedera involved in an aircraft accident in a BT-13, SN 41-23097. Collided with a BT-13, SN 41-21224, piloted by William A Mann, during formation takeoff from Beech Grove Auxiliary Field. Major damages. No injuries. Oct 12, 1943 Cadet Earl W. Miller involved in an aircraft accident in a BT-13, SN 41-21732 (W704.) Forced landing following engine failure at Lafe, AR. Major damages. No injuries. Oct 14, 1943 Cadet Richard D. Davis involved in an aircraft accident in a BT-13, SN 42-1809 (W607.) Ground collision. Cadet Davis ran into a BT-13, SN 41-23042, piloted by 2nd Lt. James M. Frew. Major damages. No injuries. 2nd Lt. James M. Frew and Passenger- John J. Higgins involved in an aircraft accident in a BT-13, SN 41-23042 (W610.) Ground collision. Lt. Frew’s aircraft was run into by a BT-13, SN 42-1809, piloted by Cadet Richard D Davis. Major damages. No injuries. 2nd Lt. Anthony J. Zabroski, Instructor, and Cadet John F. Morin involved in an aircraft accident in a BT-15, SN 42-42058. The aircraft struck wires during a simulated forced landing or buzzing. They then flew to main air field and landed. Major damages. No injuries. October 15, 1943 Responsibility for maintenance and repair of wall lockers and furniture transferred from Quartermaster Corps to Corps of Engineers. Jocelyn Dauner and Mary G Richardson of the 315th Sub-Depot, are leaving to train as Women’s Air Forces Service Pilots at Sweetwater, Texas. October 16, 1943 The Special Services Office took over publication of the base newspaper. Capt. John W. Matthews and Cadet John D. Hoscher involved in an aircraft accident in a BT-13, SN 41-22945. Ground Collision at Biggers Auxiliary Field with a BT-13, SN 41-22069, piloted by Student Officer Robert Coulter. Major damages. No injuries. 2nd Lt. Robert Coulter, Student Officer, involved in an aircraft accident in a BT-13, SN 41-22069. Ground Collision at Biggers Auxiliary Field with a BT-13, SN 41-22945, piloted by Capt John W. Matthews. Major damages. No injuries. October 20, 1943 Building No. 401 near the Commissary opened with 2 refrigerated rooms, which helped the Commissary’s refrigeration situation to some extent. October 22, 1943 Cadet Joseph T. Fordham involved in an aircraft accident in a BT-13, SN 41-21501. Taxied into a field boundary marker. Major damages. No injuries. October 23, 1943 The Base Newspaper, “The Pilot”, began publication. Oct 27, 1943 Work began by H.J. Burke Construction Co. on a new 4-room school building in Walnut Ridge to alleviate overcrowding caused by increased enrollment due to air field. Oct. 27, 1943 Capt. Seymour B. Frank and Cadet William M. Uhlig involved in an aircraft accident in a BT-13, SN 41-23027 (W713.) A low altitude simulated forced landing turned real when the engine didn’t respond at the attempted go around. Aircraft struck two trees. Major Damage, Minor injuries to Instructor. October 1943 Contractors began placing insulation board on the outside of 231 barracks units and administration buildings, latrines, and mess halls because of the difficulties in heating these during the previous winter. Nov 1, 1943 Class 44-A graduated. Nov 4, 1943 Class 44-C arrived. Nov 23, 1943 A Board of Officers was appointed to hear the matter of the fire in building 43, which occurred on February 25, 1943. Nov 25, 1943 Open Post on Thanksgiving Day. Ceremony held to award Good Conduct Medals. Nov 27, 1943 NCO Club opened. Dec 1, 1943 HQ Eighth Service Command requested WRAAF Chaplains conduct services for German POWs at POW Sub-Camp near Jonesboro. Building 402, near the Commissary, opened with 2 refrigerated rooms, 1 chiller and 1 freezer. This greatly alleviated problems in the Commissary. Cadet John F. McNeill involved in an aircraft accident in a BT-13, SN 41-1631 (700.) While attempting to park the aircraft on the ramp, the Cadet applied too much power with the stick in the wrong position and the aircraft nosed over. Minor damages. No injuries. Cadet Nelson H. Wieland involved in an aircraft accident in a BT-13, SN 41-23004. The Cadet ground looped while making a crosswind landing at Walnut Ridge. Minor damages. No injuries. Dec 6, 1943 Class 44-B graduated. Dec 13, 1943 1st Lt. Douglas W. Shaw, Instructor, and 2nd Lt. John W. Rohrs, Student Officer, involved in an aircraft accident in a BT-13, SN 41-22998. Student Officer applied brakes hard to avoid hitting another taxing aircraft. The airplane tipped forward, damaging the propeller. Major prop damage. No injuries. Dec 17, 1943 2nd LT. FRANK J. SRAMEK and Cadet CHARLES M. MORAVCIK killed in an accident in BT-13, SN 41-1354. The aircraft was observed in a long glide over a group of trees near a field. Observers heard the engine noise increase, but the airplane continued losing altitude and crashed. It is believed that the instructor was demonstrating forced landings. Cadet Fred J. Sutton involved in an aircraft accident in a BT-13, SN 41-10880 (W718.) Student landed long at Advance, MO. Cadet Sutton was instructed to make a running takeoff. When the engine failed to respond to the throttle, the student applied the brakes too hard and the airplane stood on its nose. Minor damages. No injuries. Dec 19, 1943 Cadet Henry M. Shepard involved in an aircraft accident in a BT-13, SN 41-22789 (W712.) On a night takeoff from Walcott, the student failed to maintain directional control. The airplane made a 180 degree turn just above the ground, and then crashed. Major damages. No injuries. Dec 20, 1943 Cadet William J. O’Keefe Jr. involved in an aircraft accident in a BT-13, SN 41-22244. While taxiing for a night takeoff at Walcott Auxiliary Field, the student noticed another airplane nearby and applied both brakes resulting in the nose-up of his aircraft. Minor damages. No injuries. Dec 21, 1943 Cadet George H. Mason involved in an aircraft accident in a BT-13, SN 41-21887 (W207.) The Cadet became lost on a night training flight to Biggers Auxiliary Field. After an hour and fifty minutes, he spotted the Luxora Axuiliary Field and landed downwind in the last third of the runway. The aircraft ran through a ditch and nosed over. Major damages. No injuries. Dec 23, 1943 The Times Dispatch was unable to print enough Christmas cards to keep up with the demand from the men at the Air Field. By December 23, there wasn't a Christmas card left in any of the stores in Walnut Ridge. Over 35,000 had been sold. Dec 24, 1943 Cadet DANIEL MELIE was killed in an accident in a BT-13, SN 41-22183, while on a solo aerobatic training flight. The plane entered a dive at about 3,000 feet, did a loop, almost hit some building, and then entered a second loop, striking the ground in an inverted position. The aircraft was totaled. Dec 24, 1943 Contract was authorized to add additional space to Cadet Mess, Building No. 657 due to inadequate space for cooking and storage. Late 1943 Plans had to be made to expand the Walnut Ridge School and hire new teachers due to the influx of men and their families stationed at the base. The people of Walnut Ridge offered rental facilities to the new families, further boosting the local economy. Dec 31, 1943 New Air Field PX Opened. The yellow clay-tile building featured steam heat and could accommodate more than 150 people at once. Features included a soda fountain and barber shop. Booths lined 3 sides of the wall. Tables were scattered around the room for off-duty personnel to drink a soda, smoke a cigarette or listen to their favorite recording. The fountain was open 10:00 A.M. until 10 P.M.
Jan 1, 1944 Rumors began circulating that this field would be turned over to the Navy. 210 Basic Trainers were in use at WRAAF, down from a high of 250. Jan. 1, 1944 The Pocahontas Auxiliary Field, consisting of 493.0 Acres MOL is declared surplus by the Surplus War Property Administration. Jan 6, 1944 Class 44-C graduated (estimated date). (W418?) During a night takeoff from Walcott Auxiliary Field, Cadet Pratt’s aircraft ran into a BT-13, SN 41-10826, on the runway, piloted by Cadet William K. White. Major damages. No injuries. 10826 (519.) Cadet White’s aircraft was run into while on the ground by a BT-13, SN 41-23130, piloted by Cadet John C. Pratt during night flying training at Walcott Auxiliary Field. Major damages. No injuries. Jan 8, 1944 Class 44-E arrived (estimated date). Jan 11, 1944 Pvt. Joseph M. LaChance (Mechanic) involved in an aircraft accident in a BT-13, SN 41-23043 (W617.) Pvt. LaChance was warming up the engine on the ramp which was covered with ice and snow. The aircraft began sliding forward and struck another aircraft. Major damages. No injuries. Jan 12, 1944 1st Lt. George W. Reamer, Student Officer, involved in an aircraft accident in a BT-13, SN 41-22971 (W205.) Forced landing near Paragould, following engine failure. Major damages. Minor injuries. aircraft accident in a BT-13, SN 41-22500 at WRAAF. Lt. Roemer’s aircraft ran into a BT-13, SN 42-89212, piloted by Cadet Primo A. Strada’s aircraft while taxiing. Major damages. No injuries. Jan 22, 1944 Cadet Primo A. Strada and Passenger Cadet James R. Stoner involved in an aircraft accident in a BT-13, SN 42-89212 at WRAAF. Lt. Roemer’s aircraft, a BT-13, SN 41-22500, ran into Cadet Strada’s aircraft while taxiing even though Cadet Strada ran off the ramp, trying to avert the collision. Major damages. No injuries. Jan 31, 1944 Cadet Robert J. Pastorik involved in an aircraft accident in a BT-13, SN 41-22976 (W208.) Forced landing after complete engine failure. Minor aircraft damage, major engine damages. No injuries. Jan, 1944 An ESTEY Electric Organ Installed in the Chapel. Feb 1, 1944 Work on 4-room school building in Walnut Ridge completed. Feb 3, 1944 A contract with C.A. Stuck for insulation of 231 Theatre of Operation Type buildings was cancelled since the base was expected to close soon. A contract with Rees Plumbing Company for installation of a steam heating system in the Motor Repair Shop was also cancelled. SN 41-22971, on a routine training flight. The airplane stalled at a low altitude and crashed. It is believed they were practicing a simulated forced landing. Feb 5, 1944 Col. Guillett and his wife hosted a party for the 687th Basic Flying Squadron. Feb 5, 1944 Cadet William R. Flannery involved in an aircraft accident in a BT-13, SN 41-22182 (119.) Forced landing after complete engine failure. No aircraft damage. damages. Engine condemned. No injuries. Feb 6, 1944 Class 44-D graduated (estimated date). Feb 10, 1944 Class 44-F arrived (estimated date). Feb 20, 1944 Cadet ROLLAND E. SCHUNCK was killed in an accident in a BT-13, SN 41-22217, while on a night training flight approximately 5 miles east southeast of WRAAF. It is believe Cadet Schunck became disoriented and lost control of the aircraft, which struck the ground at high speed in an inverted position. Feb 23, 1944 Fifty pre-college trainees transferred from Miami Beach, Florida. Also fifty preflight trainees were transferred in from Maxwell Field. Feb 23, 1944 Cadet Herman F. Winter Jr. involved in an aircraft accident in a BT-13, SN 41-23043 (W611.) Forced landing following complete engine failure. Minor aircraft damages. Major engine damages. No injuries. Feb 25, 1944 Cadet JOHN R. ANDREWS was killed in an accident in a BT-13, SN 42-42057, while on a night training flight approximately 3 miles north of WRAAF. It is believed Cadet Andrews became disoriented and crashed and burned. Feb 25, 1944 SSgt. Craddock & Sgt. Novachic entered Golden Gloves boxing tournament at Memphis, Tenn.
March 3, 1944 Capt. Thomas Keefe Sr, instructor, and Cadet Grover A. Charsha, involved in an aircraft accident in a BT-13, SN 41-22999. Forced landing at WRAAF following engine failure. No aircraft damage. Major engine damages. No injuries. March 6, 1944 6 Bowling Lanes were completed in the new Bowling Alley, building number 605, located behind the new base sales store. Leagues of 12 teams each were formed. March 7, 1944 Headquarters WRAAF declared 168 acres lying east of Village Creek as surplus. The land was outside the boundary fence and had not been used for military purposes since it was acquired. March 12, 1944 Class 44-E graduated (estimated date). Class 44-G arrived (estimated date). March 15, 1944 Cadet Roger E. Patton involved in an aircraft accident in a BT-15, SN 42-42055. Forced landing following engine failure. No aircraft damage. Engine crankshaft broken. No injuries. March 23, 1944 Fifty preflight trainees were transferred back to Maxwell Field, AL. training at the WRAAF, and drastically cut personnel. As this time there were about 800 cadets receiving training at the air field. U.S. Engineers office at the WRAAF would close April 10th. March 30, 1944 The Medical and Veterinarian Detachment had a party at the Post Service Club. Later dancing was enjoyed by all with the “Jive Bombers,” a local colored band. April 1, 1944 A group of Primary Training aircraft was ferried to WRAAF from Cape Girardeau for storage. The Post Engineers Carpentry Shop was partially destroyed by fire. April 9, 1944 Easter Sunrise Service planned for ramp was held in Base Theater due to a violent thunderstorm. 350 attended. April 11, 1944 The Medical and Veterinarian Detachment had a party at Walcott State Park with the “Jive Bombers.” They were transported in two chartered buses. The Base received 200 Pre-Aviation Cadet Trainees from Miami Beach, Florida. 50 Pre-Flight Trainees were transferred to WRAAF. April 11, 1944 A New Dishwasher was installed in the Cadet Mess. April 15, 1944 Approximately 1275 men were being fed in Consolidated Mess No. 2. April 16, 1944 One of the most dramatic moments in the history of the Base occurred on this date, when 98 of the 200 trainees which had arrived from Miami Beach on April 11 were relieved from pre-aviation Cadet status, for the convenience of the government, and transferred to the 106th Infantry Division at Camp Atterbury, Indiana. Colonel Guillett presided over the meeting and advised the trainees of the decision of the War Department. It was a very sad occasion for these men who had looked forward to winning their wings and serving as AAF pilots. April 17, 1944 The original Base Commander departed for a new assignment at Keesler Field, Biloxi, MS.
April 17, 1944 2nd Lt. CHARLES W IRBENECK, JR and Cadet EUGENE C. LENZ were killed in an aircraft accident in a BT-13, SN 42-89362, about 4 miles north of WRAAF while on an instrument training flight. One theory was the instructor may have had the student attempt an unusual attitude recovery which resulted in a stall, spin and crash. April 17, 1944 A fire broke out about 2000 hours and seriously damaged the Hospital Dispensary. Repairs were completed by mid June. April 18, 1944 Lt. Col. Gerald V. Kelley replaced Col. Guillett as Base Commander. Class 44-H arrived (estimated date). April 18, 1944 Cadet Irving Weissman involved in an aircraft accident in a BT-13, SN 41-22181 (W216.) Aircraft stalled at low altitude on a night takeoff from runway 31 at WRAAF. Major damages. Minor injuries. April 19, 1944 A second group of PT aircraft from Cape Girardeau was ferried to WRAAF for storage. April 20, 1944 WASP Vergie M. Bryant assigned to the Air Field. accident in a BT-13, SN 42-42056 in North Carolina while on a cross country flight. The pilot encountered fog and crashed into White Oak Mountain. April 22, ’44 The 687th BFTS held a Bivouac at Biggers Aux. Field. April 24, 1944 Flight Instructor Lt. William Price Bedingfield, age 24, was fatally injured when he was struck by a truck on a highway north of Jonesboro at night, when he stepped from behind his car into the path of an oncoming truck. He died in an air field ambulance enroute to the station hospital. SN 41-21553, three miles north of the WRAAF. The aircraft entered a spin and the student was unable to recover. The plane crashed and burned. April 30, 1944 The Finance Detachment disbanded. The 683rd Basic Flying Training Squadron disbanded. The Medical Detachment and Veterinarian Detachment disbanded. The Finance Detachment and the WAC Detachment disbanded. Sergeant Carl J Weinert, a 42 year old surgical technician at the WRAAF, was found dead in a small grove of woods near the post swimming pool around 8:30 today. It is believed he took an overdose of a powerful drug, because of financial problems. Sgt. Weinert came to WRAAF in September 1942. He leaves a wife, Pansy, of Centralia, IL. May 19, 1944 WRAAF Baseball Team loses to Blytheville AAF 8-5 at the local air field. involved in an accident in a BT-13, SN 42-89211, while on a team instrument training flight. It is believed that Cadet Ryan stalled while in a turn at low altitude. Cadet DONALD M. RYAN was killed, and Student Officer 2nd Lt. Billy J. Swinehart received serious injuries. The aircraft was totaled. May 22, 1944 Pictures were Published of Remington Arms Expert’s Shooting Exhibition at WRAAF two weeks before. Class 44-G graduated 273 Student Officers and Aviation Cadets. May 23, 1944 The movie, “Days of Glory” with Gregory Peck, played at the Base Theater. The main Post Exchange Bar opened its outside refreshment garden. Drinks were served cafeteria style. May 25, 1944 A group of Basic Trainers was ferried out of WRAAF. May 29, 1944 WRAAF “Pin-Up” Contest ends. 20 Young Ladies from various departments entered the beauty contest. May 30, 1944 USO Camp Show “Hold Tight” played at WRAAF in the Recreation Hall. Chief of Naval Operations requested transfer of Walnut Ridge Army Air Field to the Navy Department. June 1, 1944 2nd LT. LAWRENCE L. HELTON and 2nd LT. BARTO B. HAY, JR. were killed in an accident in a BT-13, SN 41-22300, one-eight mile south of the Bono Auxiliary Field. The plane, being flown by Lt Hay, appeared to attempt a Chandelle at low altitude, which produced a stall, and the plane crashed and burned. June 1, 1944 A second group of BTs were ferried out of WRAAF. June 3, 1944 Band inactivated. June 6, 1944 19 year-old Tap Dancer Marjorie Olman performed at WRAAF in a USO Camp Show presentation, ‘What’s Buzzin,’ in which she sang “Oh, Johnny Oh,” which was written by her father. June 6, ’44 The first group of PTs from Cape Girardeau was ferried out of WRAAF. June 8, 1944 Special Services held a Barbeque for the entire Post. June 16, 1944 The second group of PTs from Cape Girardeau ferried out of WRAAF. June 21, 1944 A dinner party was held at the Lawrence Hotel in Walnut Ridge with dancing later at the club. Honored guests were Mr. R. Andrews, Capt. Rivers, Benton and Lt. Haren. June 27, 1944 The last class, 44-H graduates 245 Student Officers and Aviation Cadets. June 30, 1944 Between Oct 12, 1942-June 30, 1944 Walnut Ridge had .49 accidents per 1000 hours versus .57 accidents per 1000 hours average for all schools; however, the fatal accident rate at Walnut Ridge was higher, .087 per 1000 hours versus a .052 average. The hours flown at Walnut Ridge through June 30, 1944, totaled 414,429. At full operation WRAAF had an average of 250 Basic Training aircraft in use and 27 Link Trainers. July 1, 1944 Recreation Hall closes. July 5, 1944 Officers’ Mess closes. July 18, 1944 Directive issued to close the AAFBFS, Walnut Ridge effective July 20. The number being fed in the Mess Hall had dropped to about 300. July 24, 1944 Lt. Gerald V. Kelley transferred to Headquarters AAF&FTC. Major David B. Tudor assumed command. July 25, 1944 The Civilian Cafeteria closes. Army Service Forces issues notice that the Walnut Ridge Army Air Field is classified as Surplus as of 7-21-44. July 27, 1944 The Base Chapel was turned over to the Post Engineers for closing. July 30, 1944 The Base Hospital had a total of 4,411 admissions, including 437 civilians since September 28, 1942. Two-hundred-eighty-two (282) patients were transferred to other military hospitals. There were 408 surgical operations. 47 deaths were recorded including those killed in aircraft accidents. Eighty-two babies were delivered – 42 boys and 40 girls. Aug 3, 1944 Lt. C. L. Hall, USN, arrived to assist in transfer of WRAAF to the Navy. The Navy will permit the continued operation of the Laundry by the Army Air Forces since the major portion of laundry services will be performed for Army units. Sept 1, 1944 Air Field was transferred to Navy for use by Marine Corps. Marines flew SBD5’s and FG1D "Corsairs." Marines were moved inland to Walnut Ridge and Newport from the east coast due to Hurricane season. Oct 6, 1944 First baby born to MCAF personnel in Base Hospital, a son to Lt. and Mrs. Richard D. Moore, II. Nov. 18, 1944 The War Department and Navy Department filed a Complaint with the State Utilities Commission charging that the utility rates charged Blytheville Army Air Field and Walnut Ridge and Newport Marine Corps Air Facility were higher than rates charged similar customers in the area. The complaint charged the power company lowered rates to most customers in 1943, but not to the air fields. Nov. 22, 1944 John J. O’Brian, Chief, Corps of Engineers Real Estate Division advised the Navy Department that the Walnut Ridge Base Field – 2,912.44 acres; Access Railroad Right-of-way – 15.78 acres; Radio Range Station – 11.44 acres; Auxiliary Field No. 2 (Biggers) – 640 Acres; Auxiliary Field No. 4 (Bono) – 480 acres; and Auxiliary Field No. 5 (Beech Grove – 360 acres transferred to the Navy Department as of 1 September 1944. When the facilities are no longer needed by the Navy they will be offered to the War Department. The Army Air Forces will be permitted to continue operating the laundry facilities. Nov 26, 1944 A B-17, Serial Number 44-8213 arrived at Walnut Ridge Army Field. This is the first recorded arrival of what would be perhaps 10,000 “warbirds,” which would be sent to Walnut Ridge for storage, sales, and salvage. They were part of the 40,000 airplanes which were deemed to be surplus to the Army Air Forces. Dec. 1944 A few more surplus aircraft arrived during the month of December. Early 1945 Surplus bombers, fighters, transports continued fairly slow-paced arrivals for storage at the WRAAF. 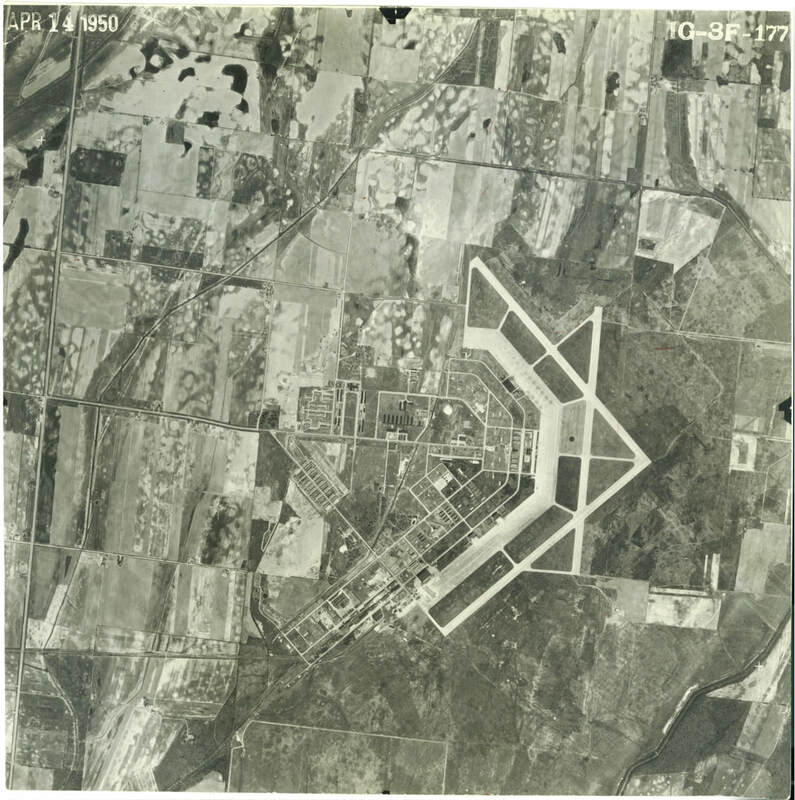 March 6, 1945 The Commanding General of the Eighth Service Command (Provost Marshal General’s Office, Prisoner of War Operations Division) requested use of a 6.3 acre tract at the Marine Corps Air Facility, Walnut Ridge as a temporary P.O.W. Camp to meet urgent agricultural needs. March 15, 1945 MCAF, WR was decommissioned and the field placed on caretaker status. April 6, 1945 Civilian Guards take over patrol of air field. July 3, 1945 The request for POWs was approved. German Prisoners were kept in the barracks formerly used for colored personnel. Local farmers would pick up a load of prisoners in the morning to help on the farm, and return them in the evening. The farmers paid the government 40 cents per hour for each POW used. A portion of this was given to the POW. July 13, 1945 Congressman Mills’ office reported the Reconstruction Finance Corporation will operate the air field at Walnut Ridge for storage, sales and repair of surplus army planes. They will assume control as soon as the Navy and Marine Corps completes inventories. July 20, 1945 Last issue of MCAF newspaper, The News and Courier was published. July 21, 1945 It was announced that the Reconstruction Finance Corporation (RFC) will take over control of the air field tomorrow. It will be used as a salvage, storage and disposal depot for surplus military property, primarily military aircraft. August, 1945 Arrivals of surplus aircraft accelerated dramatically. It was not uncommon to have 125 fighters, bombers, transport and training planes land in a day. One day, 247 airplanes planes arrived. Each aircraft was offered for sale at a fixed price, based on make and model. Most trainers and transports were sold. There were not a large number of sales of fighters and bombers. Sept. 12, 1945 A B-17, enroute from Ardmore, Oklahoma to the RFC Storage, Disposal and Salvage facility at Walnut Ridge crashed into a home in Little Rock, killing a woman and her two sons. Nov 15, 1945 RFC hosted approximately 30 news correspondents, photographers and newsreel cameramen to view the aircraft at Walnut Ridge so they could give first-hand accounts of the operation at the facility. Following that tour, one of the newspapers, the Blytheville Courier News, November 16, 1945 edition reported: “One of six salvage depots operated, more than 15,000 surplus grasshopper types and primary training planes have been sold at the Walnut Ridge depot, chiefly trainers, and more than 200 transports have been sold or leased. More than 200 aircraft have been turned over to schools and colleges for study purposes and others will be allocated for that purpose”. Nov. 30, 1945 The Northeast Arkansas Times reported that a P-38 fighter plane has been obtained by the University College of Engineering. It was flown to Fayetteville from Walnut Ridge by Ed Penic, a former major in the AAF, who served in the CBI Theater of operations, now a student at the University. Dec 20, 1945 It was announced the last German POW would leave the Walnut Ridge Camp by the end of the month. Jan-March 1946 “Warbirds” continue to arrive in large numbers, and some estimate the total number at 10,000. One book states as many as 11,000 may have been brought to Walnut Ridge. Feb. 9, 1946 Randolph County Judge signs a waiver declaring the County has no interest in the Pocahontas Auxiliary Air Field. Feb. 11, 1946 Governor Ben Laney acknowledges Randolph County’s waiver and indicates the State of Arkansas has no interest in the property. Feb. 12, 1946 Letter from City of Pocahontas, J.N. Pratt, Mayor, signed by H.E. Williams to War Assets Corporation thanking them for assistance and urging them to use their influence in transferring the property to the City. Feb. 12, 1946 Letter from Chamber of Commerce, signed by J.N. Pratt, Mayor to War Assets Corporation, stating the City’s vital interest in acquiring the Pocahontas Auxiliary Field as their Municipal Airport. April 9, 1946 A B-17 from Walnut Ridge was flown to Cumberland, Maryland by Harry Flood, a former B-17 pilot, where it will serve as a memorial to the men of Cumberland who served in WWII3. April 19, 1946 Records indicate a report was made on this date by the Field Representative, U.S. Office of Education regarding Southern Baptist College’s Application to acquire property for on-site use at the Walnut Ridge Air Base. May 16, 1946 Letter from City of Pocahontas to War Assets Corporation, referring to a letter of May 9 from the WAC to Pocahontas, and restating that the plans of Pocahontas are to only use the property as a Municipal Airport. Letter signed by the Mayor and 4 Aldermen. May 19, 1946 The Joplin Globe reported that the Civil Air Patrol announced yesterday the purchase of a BT-15 for educational purposes. The plane was flown from Walnut Ridge to Joplin. May 22, 1946 Letter from H.E. Williams, President of Southern Baptist College to Office of Real Property Disposal lists buildings the college wants to purchase and the benefits that would inure to the government. May 23, 1946 An ad by the War Assets Administration appeared in the Blytheville Courier News advertising used Motor Oil for sale for 15 cents per gallon in 50 gallon lots. June 12, 1946 Records indicate a report was made on this date by the Field Representative, U.S. Office of Education regarding Southern Baptist College’s Application to acquire property for on-site use at the Walnut Ridge Air Base. June 19, 1946 The War Assets Administration announced the selling price of Vultee BT-15 training planes had been reduced from $450 to $200 each. There were 171 available at Walnut Ridge on that date. June 20, 1946 Beech Grove Auxiliary Field (360 acres) declared surplus. Acquisition cost was $32,180.00. Betterments, including grading, drainage, fencing, and three 8x10 stage houses totaled $86,500.00. June 25, 1946 Letter from H.E. Williams, President of Southern Baptist College to to War Assets Administration listing inventory they desire “frozen” to the property the college wants to ppurchase from the government. June, 1946 Sales of individual surplus aircraft were halted, and remaining planes were put up for bid as one lot. July 1, 1946 Records indicate a report was made on this date by the Field Representative, U.S. Office of Education regarding Southern Baptist College’s Application to acquire property for on-site use at the Walnut Ridge Air Base. July 8, 1946 The last recorded arrival of a “Warbird” at Walnut Ridge was a B-17, serial number 42-102880. July 30, 1946. The land and buildings used for the POW Camp was relinquished to the Navy Department. Aug. 28, 1946 The War Assets Administration approved the sale of 4,871 of the combat aircraft, which remained at Walnut Ridge, to Texas Railway Equipment Company for $1,817,738.00. They are to be used only for scrap, salvage or other non-flyable purpose. (Many of these aircraft were flyable. They had all been flown into Walnut Ridge – several directly from the factory where they had just rolled off the assembly line.) Several hundred other aircraft at Walnut Ridge were not included in the salvage sale. Sep. 10, 1946 Letter from Office of Real Property to Southern Baptist College states interim permit should have been received for buildings 523, 598, 599 and 775 – 780 inclusive; also inquiring if the college needed building 598 and 599. Oct/ 17, 1946 Letter from Robert Whitter, Director, Instructional Division, U.S. Office of Education, Washington, expressing concern over Green County Board of Education’s request for 44 buildings on the WRAAF. Their request implied the buildings would be torn down and the materials used to construct new buildings. Nov 5, 1946 The War Assets Administration leased a portion of the Walnut Ridge Army Air Field and a number of the buildings to Texas Railway Equipment Company for the sum of $1.00 for use in salvaging the surplus aircraft. As of December 20, 1946, apartment buildings 900-925 were being used by the Texas Railway Equipment Company. It is expected they may vacate by Nov. 1, 1947. 1946-’47 Various Seventeen area schools purchased 101 buildings from the air field. Feb. 16, 1947 Fire destroyed four B-17 and B-24 bombers located at Walnut Ridge. The planes were property of Texas Railway Equipment Company. Feb 18, 1947 The War Assets Administration announced that only 500 surplus aircraft remain to be sold at Walnut Ridge. They were all C-46 Commandos. Mar. 27, 1947 Southern Baptist College made application to acquired 121.90 acres and numerous buildings on the Walnut Ridge Air Field. April 17, 1947 Certificate states that a Quitclaim Deed, dated April 17, 1947, was delivered to Mayor A.L. Wright, Mayor on May 1, 1947. April 24, 1947 Legal Notice in the Times Dispatch, NOTICE OF LEASE, for 564 acres at the Walnut Ridge Army Air Field and 480 acres at the Bono Auxiliary Air Field. April 24, 1947 A list of 31 prospective Lessees for Walnut Ridge Auxiliary Field indicates bid invitations were sent to them. April 25, 1947 A form letter from the Federal Land Bank in St. Louis was sent to prospective bidders including bid forms and plats. April 26, 1947 A Hartford, Michigan Company purchases five C-46 airplanes from the War Assets Administration to expand their air cargo service. Two have been delivered and three more will be picked up at Walnut Ridge. May 6, 1947 Abstract of Bids opened on this date shows the bidder and amounts bid on 564.8 acres situated in 7 tracts, The total rental bid amount was $2,134.50. May 9, 1947 Recommendation to accept the highest bid for each tract was approved by Federal Farm Mortgage Corporation. May 23, 1947 A 16 page third supplemental report on the Application of Southern Baptist College to acquire property at the Walnut Ridge Air Base was submitted by the Field Representative, Division of Surplus Property Utilization, U.S. Office of Education. The supplement listed buildings, their sizes, and a narrative of the college’s history and plans. Records indicate a report was made on this date by the Field Representative, U.S. Office of Education regarding Southern Baptist College’s Application to acquire property for on-site use at the Walnut Ridge Air Base. June 5, 1947 Legal Notice published in The Times Dispatch for Sale of Government Farm Real Property consisting of various tracts containing 564.8 acres at the Walnut Ridge Army Air Field and various tracts containing 640 acres at the Biggers Auxiliary Air Field. June 6, 1947 The Army Air Forces announced they are buying-back $3.5 million worth of spare parts from Texas Railway Equipment Company. The parts are being removed from some of the 4,871 aircraft TREC recently purchased from the WAA at Walnut Ridge. July 1, 1947 The War Assets Administration extended the lease of Texas Railway Equipment Company for the sum of $1.00 until November 4, 1947. July 9, 1947 Southern Baptist College made application to War Assets Administration to acquire 120.5 acres and various buildings at Walnut Ridge Air Facility to be used for educational purposes. July 16, 1947 The Mobridge, South Dakota Boy Scouts announced they are expecting arrival of their C-46 airplane on Friday or Saturday. The plane was purchased by the local Moose Lodge from the War Assets Administration, and will be flown from Walnut Ridge. Ferrying expenses will be paid for by the local Rotary Club. July 24, 1947 99 Children living in former air field quarters are being transported to school in Walnut Ridge. Chief of Appraisal Division sent appraisal report to Deputy Regional Director showing acquisition cost of buildings, land, improvements and furnishings of property SBC has applied to purchase. July 25, 1947 What appears to be a Purchase Agreement from RFC To SBC (Page 1 of document missing) is in the file with numerous exhibits attached. July 30, 1947 Recommendation from Regional Director in Little Rock to Real Property Board to approve transfer of the property to SBC. Aug. 23, 1947 Bill Odom, record-breaking around-the-world flyer flew into Walnut Ridge today to pick up spare parts for a P-47 which he purchased at Walnut Ridge earlier. Nov 5, 1947 The War Assets Administration extended the lease of Texas Railway Equipment Company for the sum of $1,798.00 per month, payable monthly in advance, until June 30, 1948. Nov. 26, 1947 The War Assets Administration approved an Interim Permit to the Walnut Ridge Airport Committee to convert Building 91 to be used as a weather station by the Civil Aeronautics Administration. Dec. 11, 1947 Memo from Director, Approval Division, Office of Real Property Disposal to Real Property Review Board contained a 3 page summary of property to be conveyed. Dec. 30, 1947 A 4 page memo from Deputy Administrator, Office of Real Property Disposal to Real Property Review Board regarding sale of property to SBC, which contains a general review and recommendations. December, 1947 The Civil Aeronautics Administration negotiated an agreement to establish a Flight Service Station in a former Link Trainer Building (Bldg. No.91) to provide weather and radio communication services to pilots. Jan. 9, 1948 Letter from Chief, Board Preparation and Action Branch to Director, Non-Industrial Division, stating that the General Board has approved sale of the property to SBC. Jan. 16, 1948 Letter to Brookland School indicates satisfactory report on Jan. 2 1948 on utilization of buildings 600 and 643 removed from MACF, Walnut Ridge. Jan 16, 1948 Letter to Ash Flat High School indicates satisfactory report on Jan.7, 1948 on utilization of buildings 224, 680, and 684 removed from MACF, Walnut Ridge. Jan 16, 1948 Letter to Bay Public Schools indicates satisfactory report on Jan.7, 1948 on utilization of buildings 601, 693, and 694 removed from MACF, Walnut Ridge. Jan 16, 1948 Letter to Maynard Public Schools indicates satisfactory report on Jan.3, 1948 on utilization of 6 buildings removed from MACF, Walnut Ridge. Jan. 18, 1948 Letter from Acting Chief, Non Industrial Division, to Real Property Supervisor, War Assets Administration, Little Rock containing instructions for sale of real property to SBC. Jan 22, 1948 Letter to Cave City High School, indicating no special form provided for compliance reporting. The report should identify the buildings transferred and show they are being utilized for educational purposes. Jan 22, 1948 Letter to Lawrence School District No. 76, Lynn, indicating no special form provided for compliance reporting. The report should identify the buildings transferred and show they are being utilized for educational purposes. Jan 22, 1948 Letter to Arkansas State College indicates satisfactory report on Jan.16, 1948 on utilization of buildings 670, 671, 672, 673, 674, 675, and 676 removed from MACF, Walnut Ridge. Jan 23, 1948 Letter to Desha School Board indicates satisfactory report on Jan.15, 1948 on utilization of buildings 661 - 665 removed from MACF, Walnut Ridge. Jan. 28, 1948 Letter from Director, Non-Industrial Division, Office of Real Property Disposal to Lawrence County Board of Education, Powhatan, stating there is no form provided for compliance reporting. The report should identify the buildings transferred and it must be established that the buildings have been reassembled intact on land owned by the School Board they are being used continuously for educational purposes. Buildings 181, 210, 211, 213, 278, 290, 291, 298, 657, 695, and 696 were obtained from the Walnut Ridge Marinc Corps Facility. Jan. 29, 1948 Letter to County Board of Education, Paragould regarding Buildings 622, 627, 653, 663, 640, 641, 641, 644, and 645 and indicating no special form provided for compliance reporting. The report should identify the buildings transferred and show they are being utilized for educational purposes. Feb 2, 1948 The War Assets Administration and the Texas Railway Equipment Company sign an amended lease deleting all areas and buildings except building No. 62 from the previous lease. (Building No. 62 was the most southwestern wood-frame hangar on the ramp.) The rent was reduced to $185 per month, and the expiration date remained June 30, 1948. As of this date all surplus aircraft had been scrapped. Feb. 5, 1948 Letter to Lawrence County Board of Education, Powhatan indicates satisfactory report on Jan. 29, 1948 on utilization of 11 buildings removed from MACF, Walnut Ridge. Feb. 7, 1948 L.W. Snow wrote the government requesting to buy back the 120 acres he sold to the government for the air field. Feb 7, 1948 Tressie Snow wrote the Project Manager, Surplus Property Disposal, requesting to buy back the land she sold to the government for the air field. Feb. 9, 1948 Letter to Cave City School Board indicates satisfactory report on Jan. 27, 1948 on utilization of buildings 582, 664, and 666 removed from MACF, Walnut Ridge. Feb. 12, 1948 Letter to County Board of Education, Paragould, indicates satisfactory report on Feb. 2, 1948 on utilization of buildings 582, 664, and 666 removed from MACF, Walnut Ridge. Feb. 13, 1948 Theo. E. Kircher, Attorney responded to Mr. L.W. Snow letter stating that if his land, tract No. 24, was not retained for airport purposes, he would have opportunity to buy it back if not needed by other government agencies, or the Reconstruction Finance Corporation for sale to small business or state and local governments. Feb. 13, 1948 Theo. E. Kircher, Attorney responded to Mrs. Tressie Snow stating that the land in question, tract N. 25, had not been turned over to the Farm Credit Administration for disposal as agricultural land; but if the land became available for disposal she would be notified by registered mail, and have 90 days to make an offer to purchase. Feb. 15, 1948 Raymond McNutt wrote the government requesting to be notified when the 1 acre of ground owned by School District 17 would be available or would it be disposed of with the air strip. Feb. 17, 1948 Theo. E. Kircher, Attorney responded to Raymond McNutt letter regarding the School District 17 land, suggesting he write the WAA Office of Real Property Disposal in Little Rock. Feb. 18, 1948 Letter to Thayer School District regarding their letter of February 5 relative to Buildings 192, 271, 273, 274, and 275 transferred from MCAF, Walnut Ridge and a theft of lumber. Complete information regarding the theft was requested for referral to the Zone Office. Feb. 20, 1948 Letter to Light School indicates satisfactory report on Feb. 13, 1948 on utilization of buildings 151, 152, 153, 154, 155, and 253 removed from MACF, Walnut Ridge. April 29, 1948 The Government sold the Base Chapel and a 247x247 foot tract to Southern Baptist College. August 5, 1948 The War Assets Administration signs a Permit granting the Civil Aeronautics Administration use of Building 40 for use by the Meteorological Division for 1 year. August 26, 1948 Letter from WAA Regional Office, Dallas, to Assistant General Counsel, Washington, D.C. regarding sale of Buildings 77, 78, 84, 330, 335, 337, 374, 430, 431, 432, 433, 434, 435, 436, 440, 443, 444, 446, 450, 452, 456, and 790 to Egypt Special School District and removed from MACF, Walnut Ridge. The letter states cross out Building 374 and substitute Building 441. 1948-‘49, Various The government sold approximately 1100 acres back to the original property owners. Sept. 22, 1948 The City of Walnut Ridge Resolved to make application for certain property located at the Walnut Ridge Airport. Oct. 7, 1948 The Hope Star newspaper announced the War Assets Administration would conduct a sale of surplus property at Walnut Ridge on October 14. Oct. 13, 1948 The War Assets Administration announced that the Walnut Ridge Marine Corps Facility is to be transferred to the City of Walnut Ridge, including 1850 acres and 60 buildings, without monetary consideration. Oct. 27, 1948 Attorney E.H. Tharp of Walnut Ridge wrote Mr. Joe Snow regarding a letter he got regarding Mr. Snow’s wife’s land, and asking him to drop by his office..
Nov. 10, 1948 Attorney E.H. Tharp of Walnut Ridge wrote the Federal Land Bank stating the Mrs. Tressie Snow wife of Joe Snow wanted to get back the 40 taken by the air base. Nov. 15, 1948 Theo. E. Kircher, Attorney responded to Mrs. Tressie Snow, regarding a letter from Attorney E. H. Tharp of Walnut Ridge, stating that all the land turned over the Farm Credit Administration had been sold; but, if additional land is received which included the track she formerly owned, she would be notified. March 7, 1949 The Government deeded Southern Baptist College approximately 120 acres including approximately 110 buildings for educational purposes. Aug. 2, 1949 Mr. L.O. Pulliam of Oklahoma City wrote the General Services Administration stating his interest in purchasing some surplus land adjoining the Walnut Ridge Army Air Field. Aug. 10, 1949 John M. McGee, of the War Assets Administration responded to Mr. L.O. Pulliam outlining the 7 priority holder classifications that would have opportunity to purchase before being offered to the general public. Further, his name would be added to its mailing list. August 16, 1949 Theo. E. Kircher, Attorney responded to Mr. L.O. Pulliam, stating his letter had been forwarded to the GSA. Oct. 31, 1942 Theo. E. Kircher, Attorney for the Federal Land Bank of St. Louis wrote Mr. O.M. Gill and informed him that he does not appear to be a former owner of the tracts of land that had been assigned to them for disposal. Nov. 2, 1949 Mr. O.M. Gill wrote the Surplus Property Disposal Project Office wondering why he could not get back tract No. 22 which the government had purchased from him. Nov. 4, 1949 S. Jerome Smith, Project Manager of Surplus Property Disposal responded to Mr. O.M. Gill that the property assigned to them for disposal did not contain tract 22. Jan 5, 1950 The Government deeded 1,865.78 acres of the former WRAAF to the City of Walnut Ridge to use as a public airport. Jan. 11, 1950 Letter from H.L. Ponder, Attorney to General Services Administration, Dallas, stating his opinion that the City of Walnut Ridge is authorized to buy airport property. Undated Memorandum Opinion by John M. Montgomery, Attorney, stating that Walnut Ridge is has legal authority of own and operate an airport. Jan. 12, 1950 Resolution by the City of Walnut Ridge was approved authorizing Mayor E.K. Riddick to accept delivery of the quitclaim deed for the the property and binding the City to the terms, reservations, restrictions and conditions thereof. Jan. 23, 1950 Government sold 44 acres to original owner, Edwin L. Moore for $2,400 The Government had paid him $6,585 for this property..
Jan. 23, 1950 Government sold 5.6 acres to original owner, L.T. Lasiter for $175 The Government had paid him $396 for this property. Jan. 23, 1950 Government sold 54 acres to original owner, George M. Shipmen, for $3,600. The Government had paid him $7,400 for this property. Jan. 24, 1950 Letter from City of Walnut Ridge, signed by E. Hart, Jr., Recorder to General Services Administration, stating that three certified copies of resolution authorizing Mayor Riddick to accept quitclaim deed are enclosed. Jan. 27, 1950 Government sold 63.94 acres to original owner, Wm M. Hennessee, for $3,200. The Government had paid him $6,154 for this property. Jan. 27, 1950 Government sold 2.5 acres to original owner, Harry Joseph Bagley, for $75. The Government had paid him $212.60 for this property. Jan. 27, 1950 Government sold 179.5 acres to original owner, Mary Sue Hukill, for $8,500. The Government had paid her $15,862.50 for this property. Jan. 27, 1950 Government sold 80 acres to Maggie B. Kirkpatrick, heir to C.L. Bottom original owner, for $4,200. The Government had paid $8,685 for this property. Feb. 9, 1950 Government sold 111.10 acres to original owner, Jake Less, for $6,000. The Government had paid him $9,946 for this property. Feb. 9, 1959 Project Record indicates as of this date the government had completed the sale of 8 tracts of Walnut Ridge Airfield property containing 541.03 acres for $28,150.00. 1952 Walnut Ridge built a new Airport Administration on the site where the WWII Base Operations Building stood. Firebrick from two smelters were used for exterior and interior walls. Inside walls were plastered and outer walls were faced with red brick. Nov 23, 1954 The Government leased two tracts of land on the former Army Air Field from City of Walnut Ridge for USAF 725th Aircraft Control & Warning Squadron. Apr. 6, 1955 It was announced today that a $359,372 contract was awarded to King Construction Co. of Texarkana, TX for construction of 17 prefabricated steel buildings at the Walnut Ridge Air Force Station. There were 14 bids on the project. Sep. 14, 1956 The Harrison Daily Times newspaper reported Midway Trailer Corp. of Grapevine, TX, will open a manufacturing plant at the Walnut Ridge airport within 2 weeks and employ about 50 people. 1956 The 725th AC&W Radar Facility began operation. 1963 The 725th AC&W was decommissioned. April 9, 1965 725th AC&W Buildings and Improvements were deeded to City of Walnut Ridge. May, 17, 1966 The City of Walnut Ridge sold the 27 former 725th AC&W single-family housing units to Southern Baptist College. The college has used these for faculty and staff housing. 1968 The Airport Commission built a new restaurant and operations building across the street from the former Base Operations building. 1969 The FAA Flight Service Station moved to Jonesboro. Except for the Remote Air-Ground Communications facility situated near the southwest corner of the original air field property, this ended the Government’s 27 years with some presence and use of the former Air Field. The RAGC facility is still used by the Memphis Air Traffic Control Center as a vital link in maintaining contact with aircraft over vast portions of Arkansas and Missouri. 1971 United Parcel Service (UPS) established a distribution center at the Walnut Ridge Airport. It was in a blue metal building about where the Air Field Crash Station was located. The building was later used by American Agviation.